Votre White Essence Brightening Masque is extensive blend of herbals and botanicals complex that works to give a fair complexion. Its work on discolouration and gives skin lightening effect making the skin clean and radiant. This votre face mask comes in a light weight container with a silver colour screw open lid. It is travel and user friendly. The face mask looks like a thick fuller earth mixture, I mean it looks like sand mix. The texture is so thick. It smells like a medicine and weird. I have used this face mask regularly weekly twice and I liked the results very much. This face mask helped me to reduce my tan on the face and neck as well as the pimple marks. It Doesn't dry out my oily skin, may be dry skin people need to moisture their skin after using this face mask. Though it smells weird I use to tolerate the smell for the outcome. After washing my skin it looks clear and bright. You can see the visible results from the first use itself. The texture is so thick so you have to mix it with some water and then spread it all over the face and neck. I saw some of my old pimple marks also got lightened after using it regularly. The result of the face mask stays up to next day. It gives a natural glowy and bright skin. It never broke out my skin, I was afraid of using it because of the smell. But, later I realised that this face mask is worth trying regularly. It suited for my sensitive oily skin. I am left with small amount of this face mask now and saving it for occasional use. I liked this face mask very much other than the weird smell and the overprice. But it is worth trying to get visible results. It gives clear and glowy skin. It Doesn't dry out the skin. 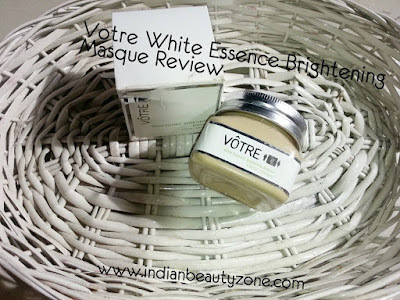 Votre White Essence Brightening Masque is a good face mask for those who want a product that gives visible results, it really reduce the tan and pimple marks.